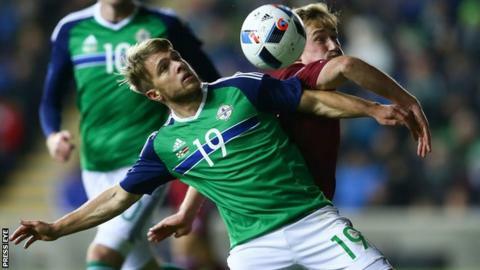 Steven Davis scored the decisive goal 10 minutes after half-time as Northern Ireland ended a run of 23 friendly games without a win by beating Latvia. Seventeen of those matches were lost in a run stretching back to March 2008. The midfielder latched onto a long ball out of defence by Craig Cathcart and fired home the rebound after an initial header was saved by Andris Vanins. Michael O'Neill's Euro 2016 finalists dominated throughout and extend their unbeaten run to eight matches. The victory came in the first of five proposed warm-up fixtures for Northern Ireland ahead of next summer's tournament in France. The men in green had secured their qualification for the finals by topping their group and ending as top scorers but O'Neill had warned his players to take every opportunity to impress as he contemplates his final 23-man squad. In contrast, Latvia, managed by former Southampton striker Marian Pahars and ranked 70 places below their opponents in the Fifa world rankings, finished bottom of their group, having failed to win any of their 10 matches. O'Neill's decision to experiment with a 3-5-2 formation paid dividends as his side completely dominated possession in the first half, creating several goal-scoring opportunities. Jamie Ward, partnered with Kyle Lafferty up front, saw his swerving right-foot driver parried by Andris Vanins and then his low left-foot strike across goal was again saved by the Latvia goalkeeper. Home skipper Davis forced Vanins into another fine stop with a clever side-footed effort and then provided the pass which sent Lafferty through on goal, but the Norwich City striker - who has been attracting interest from Leeds United - skewed his shot wide of the target. The hosts continued to boss affairs after the interval as Lafferty held off a defender and forced a fine stop from the busy visiting keeper. The former Rangers striker then narrowly failed to get on the end of an inviting right-wing cross from Conor McLaughlin. Davis' goal from close range was just reward for Northern Ireland's efforts and Latvia's best chance of an equaliser fell to substitute Artjoms Rudnevs two minutes from time, but his shot flew wide of the post. Having scored twice in Northern Ireland's crucial 3-1 triumph over Greece which secured qualification for the Euros last month, skipper Davis produced another authoritative performance in midfield. The Southampton player pulled the strings in an impressive first-half display and then showed the necessary determination to follow up his initial effort to score his eighth international goal. NI manager Michael O'Neill: "It was important to keep up the winning momentum and I thought we controlled the game from the first minute to the last. "We changed the system to play three at the back and I was pleased with a lot of aspects of our play. "There were some fine individual displays from the likes of Craig Cathcart, Jamie Ward and Stuart Dallas, although I thought our final ball could have been better in the first half and we could have created more chances." All eyes are on the draw for the Euro 2016 finals in Paris on 12 December. Michael O'Neill's men will be in Pot Four, the bottom group of seeds. Two further friendly dates are planned for March 2016 and two more for May, before the finals begin on 10 June. Match ends, Northern Ireland 1, Latvia 0. Second Half ends, Northern Ireland 1, Latvia 0. Craig Cathcart (Northern Ireland) wins a free kick in the defensive half. Foul by Kaspars Gorkss (Latvia). Janis Ikaunieks (Latvia) wins a free kick in the defensive half. Corner, Latvia. Conceded by Shane Ferguson. Attempt missed. Artjoms Rudnevs (Latvia) right footed shot from the centre of the box misses to the left. Assisted by Vladislavs Gabovs with a cross. Foul by Vladimirs Kamess (Latvia). Substitution, Latvia. Vladimirs Kamess replaces Deniss Rakels. Substitution, Northern Ireland. Paddy McCourt replaces Steven Davis. Corry Evans (Northern Ireland) wins a free kick on the right wing. Foul by Antons Kurakins (Latvia). Substitution, Latvia. Janis Ikaunieks replaces Olegs Laizans. Foul by Liam Boyce (Northern Ireland). Corner, Latvia. Conceded by Craig Cathcart. Substitution, Latvia. Pavels Steinbors replaces Andris Vanins. Attempt missed. Chris Baird (Northern Ireland) right footed shot from outside the box is high and wide to the right. Substitution, Latvia. Valerijs Sabala replaces Eduards Visnakovs. Offside, Northern Ireland. Conor McLaughlin tries a through ball, but Corry Evans is caught offside. Substitution, Northern Ireland. Shane Ferguson replaces Stuart Dallas. Substitution, Northern Ireland. Liam Boyce replaces Jamie Ward. Josh Magennis (Northern Ireland) wins a free kick in the attacking half. Attempt saved. Steven Davis (Northern Ireland) right footed shot from outside the box is saved in the centre of the goal. Assisted by Conor McLaughlin. Offside, Latvia. Arturs Zjuzins tries a through ball, but Eduards Visnakovs is caught offside. Offside, Northern Ireland. Stuart Dallas tries a through ball, but Josh Magennis is caught offside. Attempt missed. Antons Kurakins (Latvia) left footed shot from outside the box misses to the left following a set piece situation. Foul by Jamie Ward (Northern Ireland). Kaspars Gorkss (Latvia) wins a free kick on the left wing. Substitution, Latvia. Artjoms Rudnevs replaces Aleksejs Visnakovs. Attempt missed. Corry Evans (Northern Ireland) right footed shot from outside the box is high and wide to the right. Assisted by Gareth McAuley. Corner, Northern Ireland. Conceded by Vitalijs Jagodinskis. Steven Davis (Northern Ireland) wins a free kick in the attacking half. Goal! Northern Ireland 1, Latvia 0. Steven Davis (Northern Ireland) left footed shot from the left side of the six yard box to the centre of the goal.